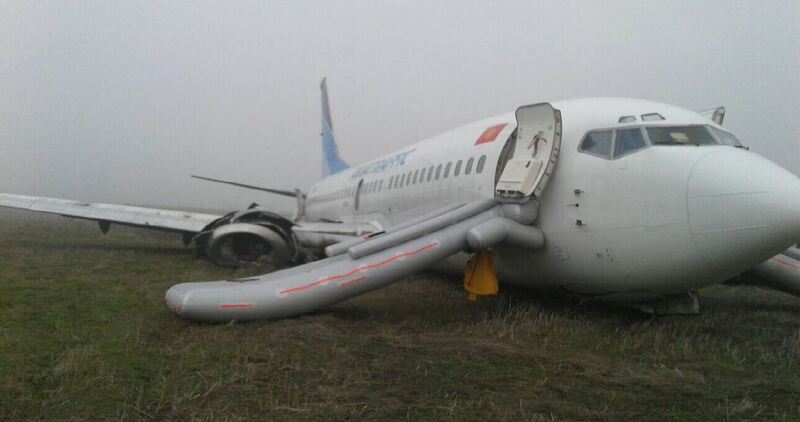 Boeing 737-300, EX-37005 (24681/1929), operated by Aviatraffic Company Kyrgyzstan has been written off in a runway excursion at Osh, Kyrgyzstan (UCFO) Runway 12 following damage sustained during a poorly performed go-around on its previous approach in fog which left the aircraft with an engine and hydraulics failure. The report issued by the MAK in Russian describes how the crew should have commenced the go-around at a height of 60m but was belatedly initiated at 45m. The weather conditions were below minimums for the Cat 1 ILS on Runway 12 which are published as 720m RVR / 200ft DH. The captain (PF) applied TOGA thrust and called for flap retraction, but then pushed forward on the yoke in response to the natural pitch-up motion of the aircraft due to somatogravic illusion (nose up illusion) due to possible fatigue. This lead to the aircraft descending towards the runway. The gear was retracted before a positive rate of climb had been confirmed. 5 seconds after TOGA was selected the aircraft was still at 38m/125ft over the runway. The inactivity of the first officer prevented rectification of the captain's error. The GPWS "DONT SINK" sounded and although the RoD was reduced from about 1,570ft/min to 790ft/min, the aircraft struck the runway at 178kt, 226m beyond the threshold with a force of +3.96G. The landing-gear had been only 4s into its 9s retraction cycle and the undercarriage was still in an intermediate position when the impact occurred causing the aircraft to sink onto its belly and sustain damage to the landing gear, #2 engine and hydraulic systems A & B. The aircraft became airborne and the Captain initially elected to divert to Bishkek because of the weather but as the engine and hydraulics failed he elected to return to Osh. On the second landing the landing gear failed on touchdown. the aircraft effectively landed on its engines and the underside of the fuselage. It touched down about 1,400m from the threshold and continued to slide along the runway for about 500m. The occupants evacuated via slides, there were injuries but no fatalities.